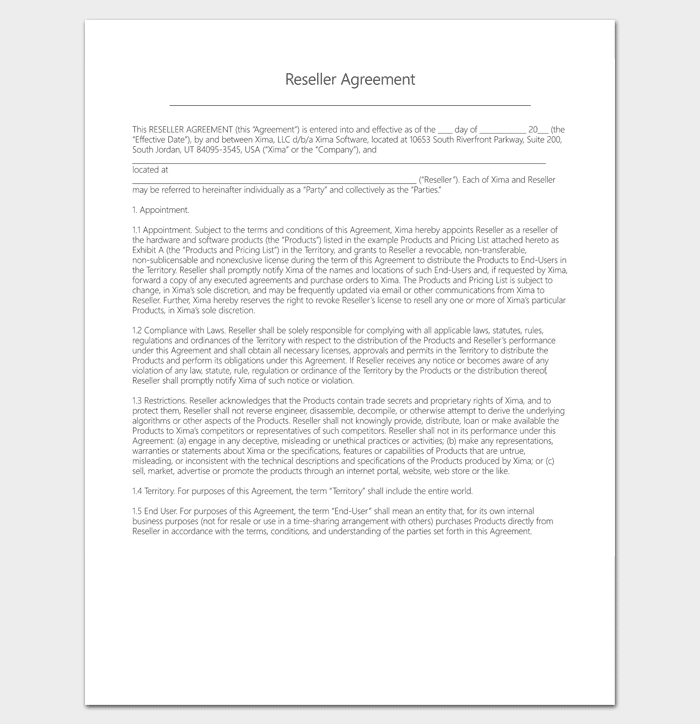 A Reseller Agreement Template is used when two parties are agreeing on the process by which one of them will be selling on products. 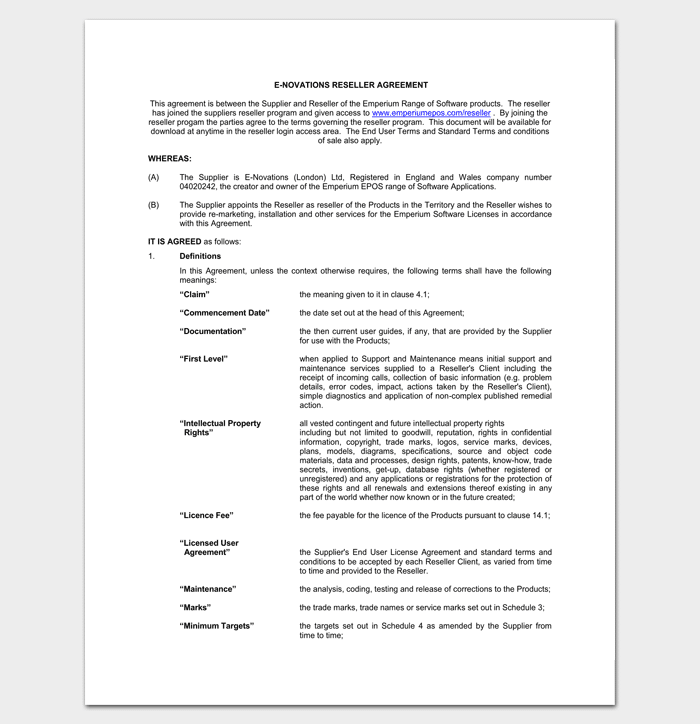 The Reseller Agreement Template is a resource designed to allow the initial producer or distributor to use clear, concise language and clean, professional formatting. 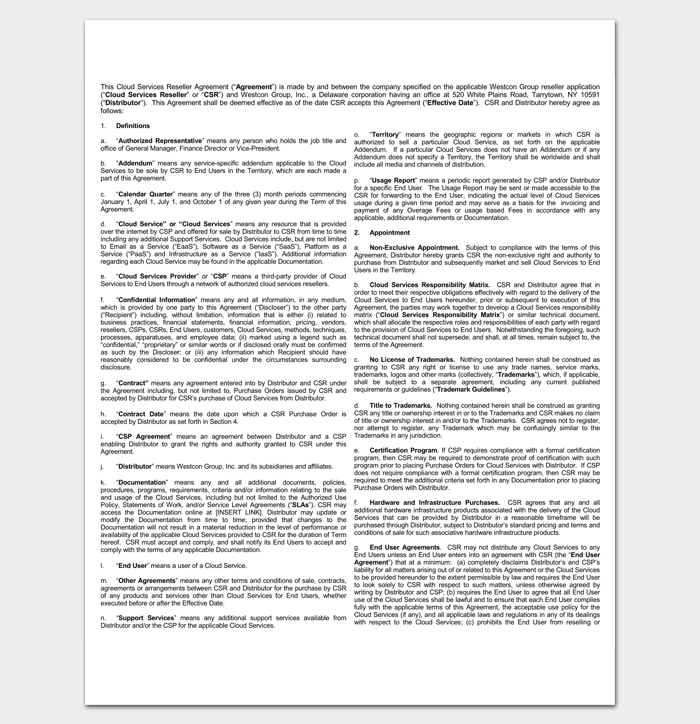 Reseller agreement checklists, templates and samples to help you. 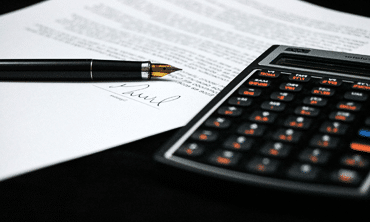 When Will You Need a Reseller Agreement? A product reseller agreement outlines exactly what the seller can or cannot do while in the process of reselling and stocking the products in question. Protect your brand with a product reseller agreement that allows you to control the way your products are sold. A product reseller agreement puts in writing the limitations and scope of the authority of the reseller to represent your brand. Keep your brand off commerce platforms that are prone to counterfeiting and plagiarism with a product reseller agreement. An SaaS reseller agreement template allows you to craft an agreement that defines the terms of an application hosting through a third party provider with ease. SaaS or “Software as a Service” sales can be notoriously difficult to manage without a quality SaaS reseller agreement template. 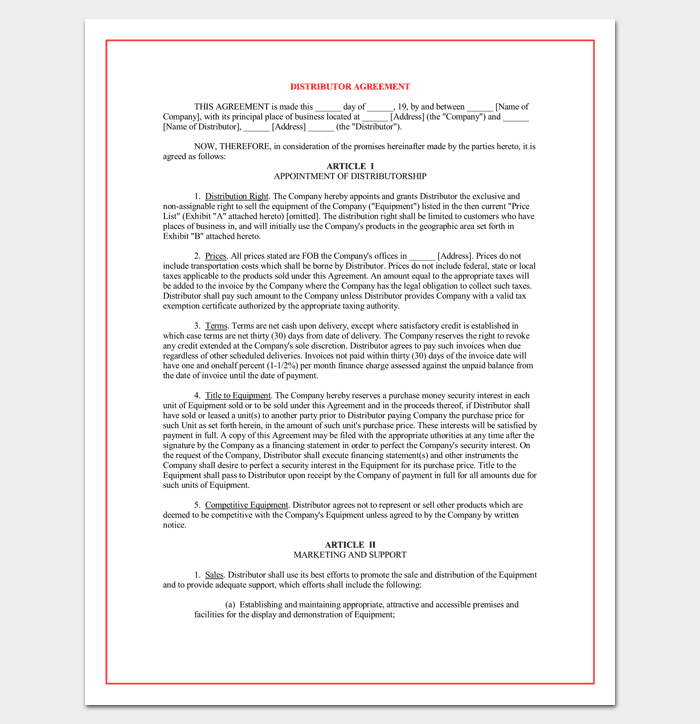 A template makes it easier to present a professional and legally compliant SaaS reseller agreement. 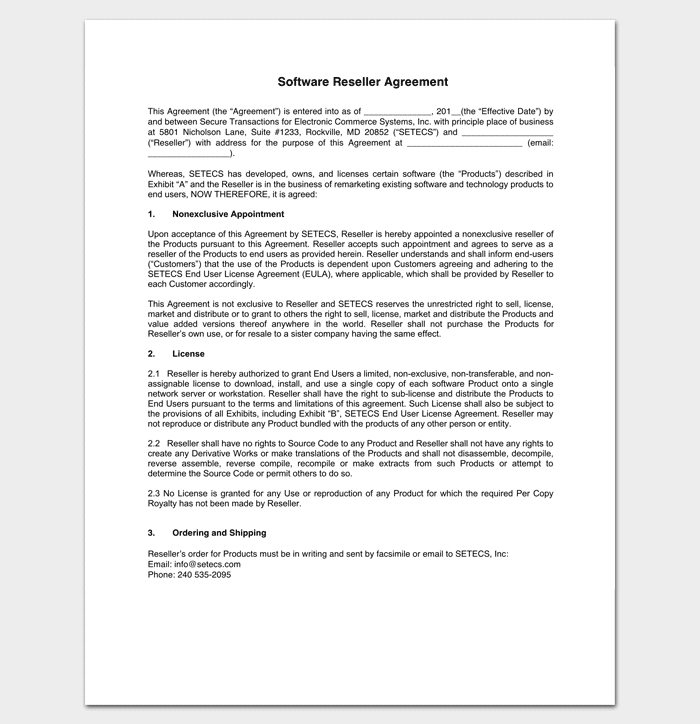 A software reseller agreement checklist is an itemized step by step list that will guide you throughout the process of a reseller agreement. Software reselling can be treacherous to navigate without a software reseller agreement checklist as there are a lot of factors to consider. Missing out on details by neglecting to use and appropriate software reseller agreement checklist lead to serious ramifications for your business. If the software is your business then using the right resources when authorizing a reseller, such as an agreement checklist, is crucial to presenting a professional and efficient image. 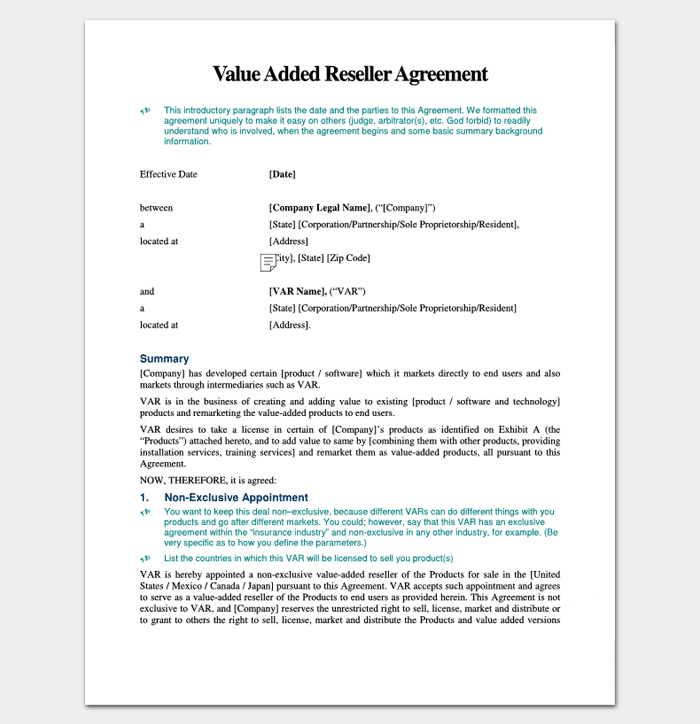 An Agreement for Value Added Reseller outlines in what way an item is to be altered by the purchasing party before being sold on for a greater price. A value-added reseller should only be utilizing your product in a way that does not damage your brand and you can outline the scope by which they are able to use your product with a well-crafted agreement. Maintaining control over the reputation of your product is essential so a value added reseller agreement acknowledges when a party is authorized to alter your product for further sale. When you are manufacturing components or parts an agreement for value added reseller is essential. You will need a reseller agreement whenever you are producing goods that another company or business is purchasing to sell to the public or other businesses. For example, if Party A produces goods of some description such as dresses, and Party B owns a shop and wishes to sell those dresses, then the two parties would come to an arrangement as the terms and conditions under which this would happen. This could include an agreement that Party B would not undercut Party A’s prices, or sell the products on certain formats such as online auction sites. These conditions are often established to protect the reputation and intellectual property, or designs of the initial producer, in this case, Party A. It also formally confirms the authority of Party B to resell the goods in question. The agreement might also dictate if Party B is able to modify the dresses in any way. Double check – Whether you are writing or signing a reseller agreement it is crucial to know what terms you are agreeing to. Not only will these conditions be binding for you, but also for the other party, so be sure that you understand every condition completely. Ask Questions – Don’t be afraid to question the other party about the agreement. Talking to the other party prior to writing up and signing the agreement can save everyone a lot of time and energy in the long run. Be Detailed – Ensure that, when you are writing a reseller agreement, that you include as much, clear and coherent detail about your products, expectations, and conditions of resale authority. Look for Problems – Look for potential problems that could arise from the reselling agreement. When you are writing a reseller agreement ensure your business is properly protected, and when you are signing a reseller agreement ensure that there is nothing in the agreement that could damage your enterprise. The other party may not have your best interests at heart, be sure to check for potential red flags. Use a Quality Template – A quality template or sample is a great framework from which to base your reseller agreement as they based on tried and tested models. Templates help you to check that you are including all the relevant details and use clear, professional formatting.